The Liberal government purchased over 2 million acres (800,000 hectares) of Māori land to sell to settlers. They also purchased Lake Wairarapa because European farmers had complained that it periodically flooded their lands. Eventually Ngāti Kahungunu agreed to sell in return for money and land in the Waikato. 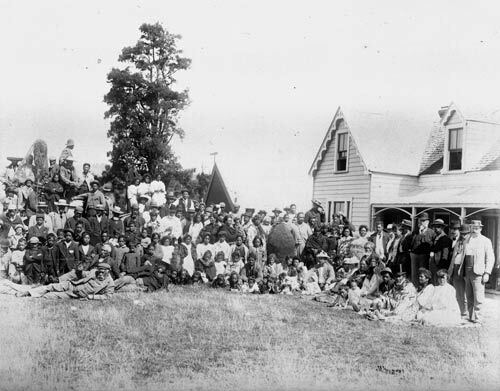 This gathering followed the sale, which occurred outside Raukura’s whare at Pāpāwai, near Greytown. The roof of the whare can be seen in the centre background.